Last year, I realized I was quickly becoming bored with my existing N scale model railroad. 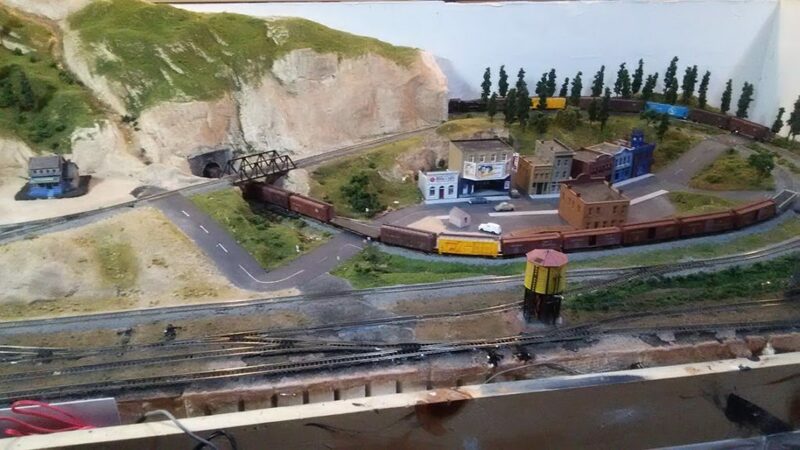 It was based on the Woodland Scenics “Scenic Ridge” kit, a basic 3′ x 6′ layout with a fairly simple track plan. It didn’t offer much in the way of operations (picking up and delivering freight cars) and was basically just set up to watch trains run. Scenic Ridge had served me well. It was a great layout to learn many of the skills needed to build a model railroad, but it was time to move on. -minimum 15″ radius curves to accommodate larger locomotive such as my Union Pacific 4-8-4 #844. I had also decided that I didn’t want the train to go “around the town”, but instead wanted to find a way to make it seem that the train was going through town. In addition, while I really wanted more operational capability, I also wanted the ability to just “watch trains run”, when I felt like it. Finally, I decided that I didn’t want elevation changes in the track. Many N scale locomotives are too small and too light, and they have a difficult time pulling trains up a steep grade. Initially, I designed an “L” -shaped layout that would fit in the same corner of my basement that the existing layout was in. 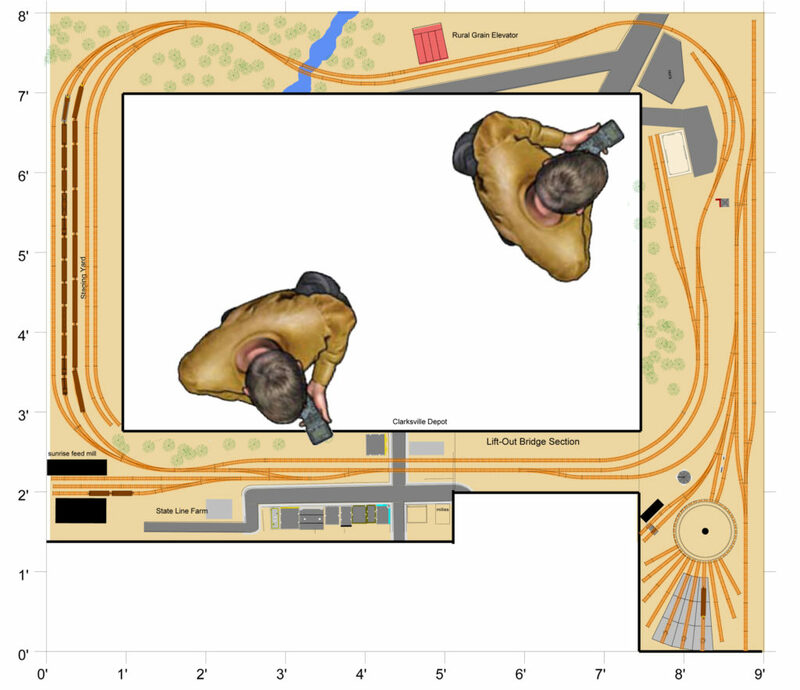 However, after reading an article about choosing a track plan shape, I realized I had another requirement: I wanted the train to only pass through each scene on the layout once. I realized I’d need to do an “around-the-room” type of layout. I was limited on space (about 6′ x 9′), so I decided that if I was going to make it work, I’d need to utilize the space as efficiently as possible. 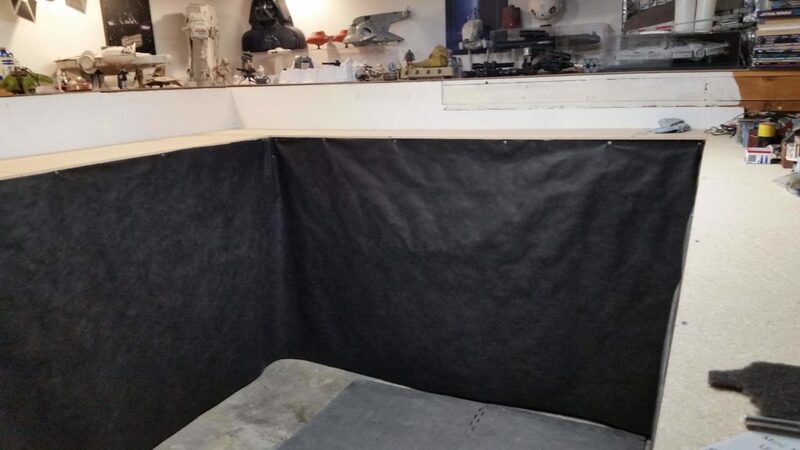 The area of my basement that I was going to use serves as storage space, so I decided to design the layout in such a way that the space underneath the benchwork could still be storage for all of our other “stuff”. 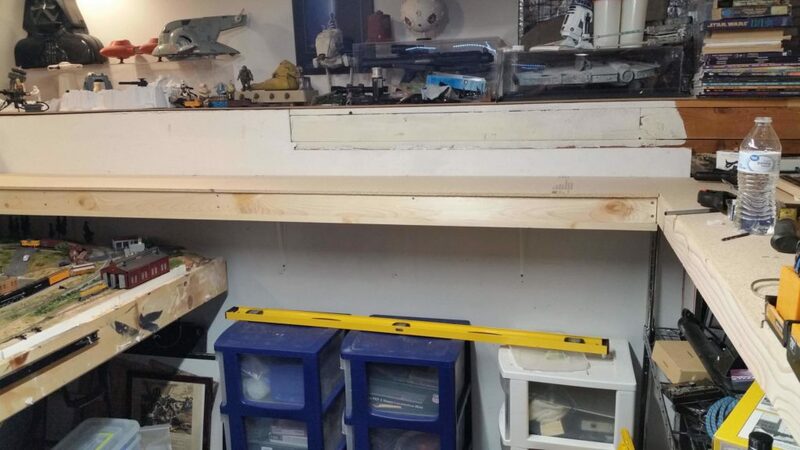 After working on the track plan off-and-on for a few months, I came up with an “around-the-room” layout, with the depth of the benchwork ranging from 12″ to 18″ to “hide” the storage shelving that would be underneath it. My “almost” final design for the track plan. The track plan gave me nearly everything I wanted: The ability to run trains continuously, a staging yard, a small freight yard with a roundhouse and turntable, a passenger depot, and 4 industries to switch/service. The track ran “through” town as well. I bounced the track plan off of a couple of friends (thanks Phil and Vet!) in the local model railroad club, and they made some helpful suggestions, including adding a spur at the grain elevator (using the existing siding as a passing/runaround track), and extending the runaround track in town past the grade crossing (where the street crosses the railroad) to make room for more freight cars. I’ve implemented those suggestions in the actual build. I finally started construction on the new layout in November, 2018. 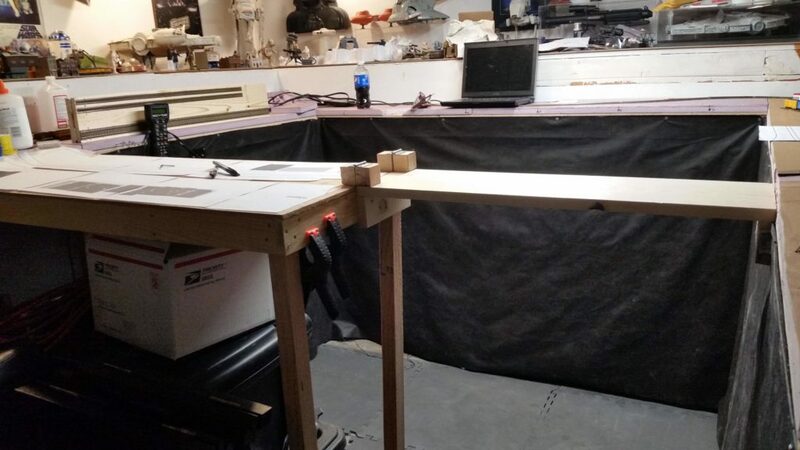 The benchwork (the table the layout is built on) from 1″ x 3″ lumber, 3/8″ particle board, and heavy-duty shelf brackets. Mounting the layout to the wall with shelf brackets allowed me to fit the wire rack shelves, rubbermaid totes, etc underneath. The most difficult part of the job was working around all of the stuff stored in the room, since there was nowhere else to put it while I built the benchwork. 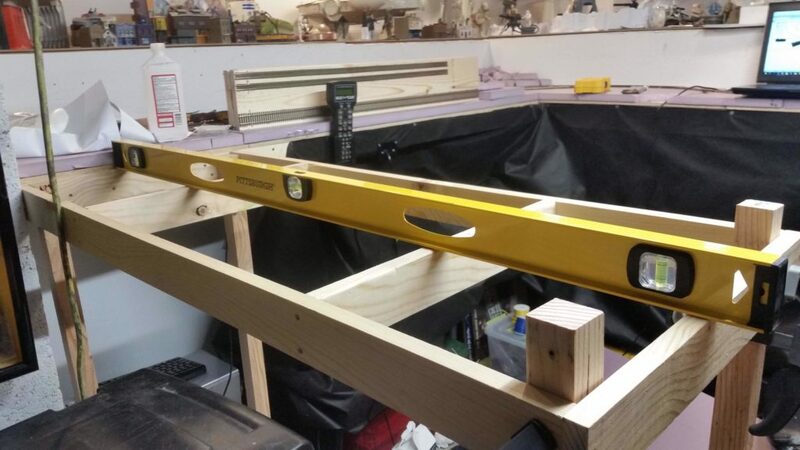 first section of benchwork before leveling it. 2nd section of benchwork installed. You can see my old Scenic Ridge layout that I hadn’t yet moved out of the room. 3 of the 4 sections of benchwork installed, room cleaned up, and “curtains” installed. I used landscaping fabric from Home Depot, it’s very cost-effective. You can see a bit of my other expensive hobby above the layout. The final section of benchwork, I secured the far end to the existing benchwork, leveled it, clamped the legs in place, marked where to cut them off, then cut them and screwed them in place. 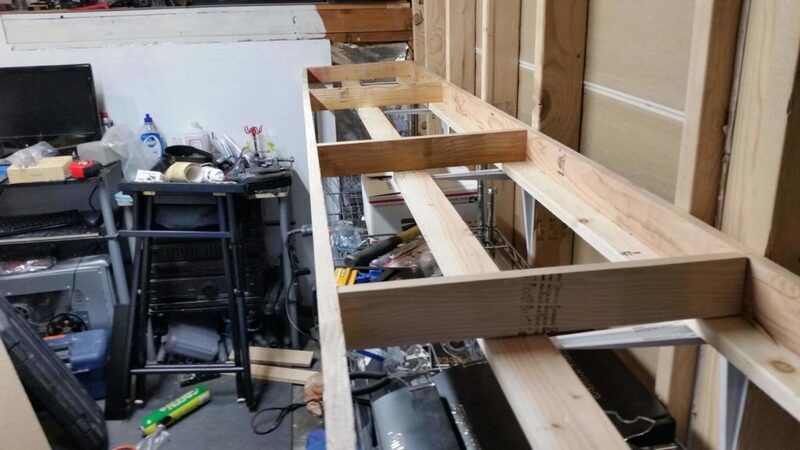 With the benchwork built, the next step was to build the lift gate – a section of the layout that would hinge upwards to enter the room. After watching several videos on youtube, I decided to borrow the basic design from MonsterRailroad as seen in this video. I changed how the power is fed to the track, I’ll cover that later. 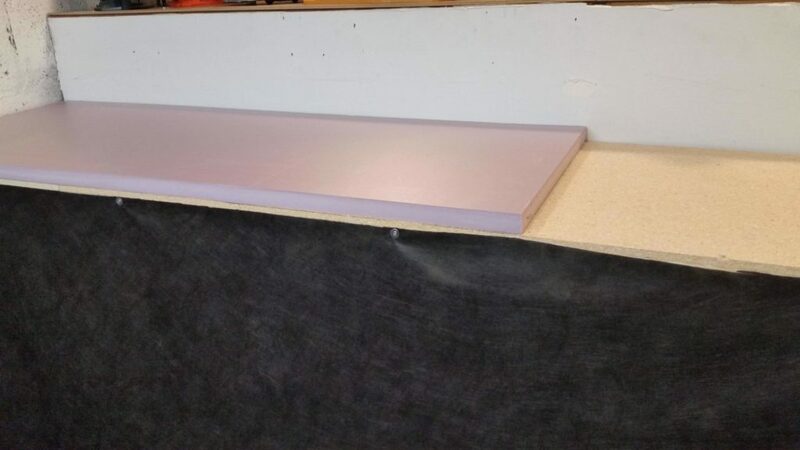 With construction of the benchwork complete, I then installed 1″ rigid foam insulation board on top of the benchwork. This would serve as the base work surface to install the layout on. I chose to use foam for a couple of reasons. First, it absorbs sound. Second, it’s easy to carve/cut if you want to add valleys, rivers, etc. Third, it’s very easy to pin roadbed and track in place while the glue dries. Installing ridid foam insulation on the layout. With the benchwork built and the foam installed, the next step was to transfer the track plan to the layout.